it’s game time- leave the cooking to us! Choose your met and sides: Pulled pork sliders, Brisket sliders, Pork Ribs, and Sides: Coleslaw, Mac & Cheese, Creamed Spinach, Potato Salad, Baked Beans. Sliders come with 8 per order (1 lb of meat total amount, approx 2 oz per slider) . Order as many quantites of 8 as you need. Sliders come assembled on Hawaiian buns. Let us know when ordereing if you wan yours unassembled with buns on the side to let guests make their own. Sides are ordered by the 1/2 lb and each 1/2 lb feeds 2-3 people. Please place your orders by Sat Feb 2nd online here. Pickup anytime on Sunday Feb 3rd. Please specify desired pickup time in the comments when ordering. Don't feel like cooking? Don't worry- we do! 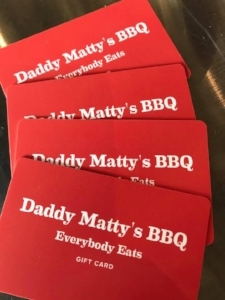 A Daddy Matty's gift card is perfect for any occasion - Father's Day, graduation, birthday or even to say thanks to that special teacher. Contact us to order. Order some Daddy Matty's famous small batch barbecue sauce. Now in original and spicy blends! Sign up with your email address to receive weekly meal menus and ordering information, and special announcements.